In 1960, scientists did one of those experiments that just aren't allowed anymore. 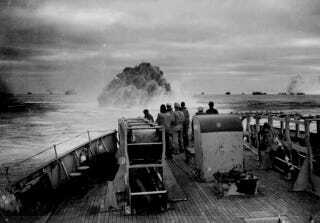 For the sake of science, they blew up three 3oo-lb anti-submarine bombs off the coast of Australia. A listening station 10,000 miles away in Bermuda—on the exact other side of the planet—waited. And waited. And, about three and a half hours later, they saw the blip that confirmed their hypothesis: Yes, sound in the ocean really can travel across the world. Some fifty years later, Brian Dushaw, an oceanographer at the University of Washington, has been reconstructing that 1960 experiment. His interest is not sound, however, but temperature. Sound travels more quickly through warmer water, and the speed at which sound traveled in 1960 is thus a snapshot of average ocean temperatures half a century ago. Much ocean temperature data is also of surface waters, but the 1960 experiment provides data for what happens about a kilometer down, in the Sound Fixing and Ranging (SOFAR) channel. That's because sounds in the ocean don't just bounce around willy nilly. Due to a quirk of physics, sound waves about a kilometer deep, though the exact depth varies, get trapped in the SOFAR channel: The competing influences of temperature and water pressure keep those waves in the zone, where sound's speed is at a minimum. Sound can neither easily enter nor leave the SOFAR channel, and it can travel thousands and thousands of miles unattentuated. Whale song travels through the ocean in the channel. Submarines go out of their way to avoid it and evade detection. As Dushaw explained at last week's Acoustical Society of America meeting in San Francisco, he has spent the past decade tracking down and deciphering documents to figure out the exact parameters—such as location—of the explosions in 1960. With the help of a retired lieutenant commander in the Australian navy, he's deciphered the logs of the ship that fired the original shots. "I thought they were useless at first," he said of the cryptic, terse ship logs. Although the ship logged its velocity multiple times a day, Dushaw explained, he had to use dead reckoning to figure out its position; however, there is a great deal of uncertainty in the method, because dead reckoning does not take into account the wind or the current a ship is moving in.